It’s been a few weeks since I started my first real calligraphy class in mid-September, and I can’t get enough! Last year, after deciding to be more serious about calligraphy (and Copperplate in particular), I checked out a few books, went online for instructions, but just couldn’t really get my writing to look the way I wanted. I really wanted to learn it the “right way” with a professional. After finding the Society for Calligraphy, I emailed a few local calligraphy teachers in February, and one teacher wrote me back. She told me she wasn’t teaching Copperplate at the time and suggested I email a few others (who never wrote me back for one reason or another). In August, she contacted me again about starting a Copperplate class, and so I began my Copperplate studies with Yukimi Annand. I was really glad my friend Winnie was interested in taking the class as well and decided to join me. It’s so much better to have a friend along on this great journey. I also purchased a variety of pointed pen nibs to find the one that works. It’s almost like finding the perfect wand in the Harry Potter stories; you have to try different ones to find “the one” that’s right for you. So far I really like the Japanese nibs because they write so smoothly and do not catch the surface of the paper (like Gillot 303) which drives me crazy! I’ve been reading posts in the Fountain Pen Network forum that suggested some vintage nibs, so I will see if there are any reasonable ones available on eBay to give them a try. 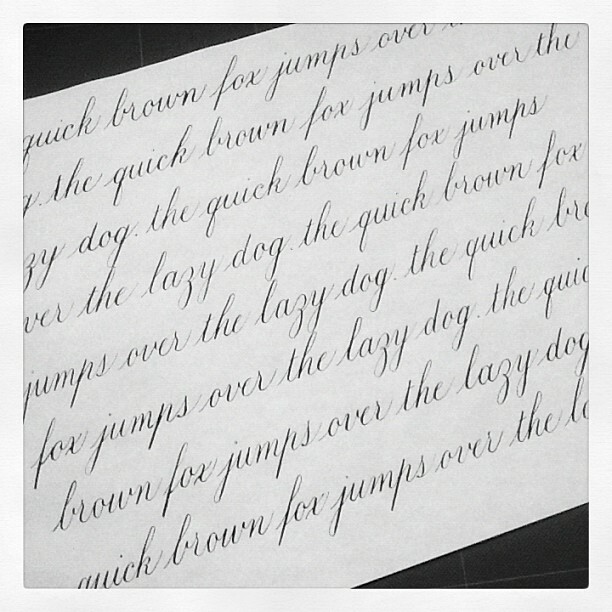 So far, I am loving Copperplate and calligraphy in general. I wish I had started sooner! This entry was posted in The Learning Process and tagged copperplate on October 8, 2011 by linda.